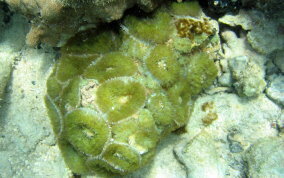 This is member of the Cnidarian family, so they are not unlike the sea anemones and corals. Their bodies consist of a flat disc with tentacles surrounding the oral opening. They will be found as single individuals or in masses of great numbers. Their color is green with blue overtones and often have an iridescent translucency. The average body size is about 3 inches in diameter.